I used to think faith was a box with lines and edges, but now I think of it more like the ocean ~ liquid, flowing, changing. It doesn't sit still, it doesn't stay the same. As life pours out good and bad situations, so faith lifts and drops with it. Sometimes bad situations bring huge cresting waves of faith and sometimes they pummel you down to the ocean floor. I'm not talking about wavering faith, although that certainly happens too. I'm talking about the aliveness of faith, the growing of it. It's like noticing your child has grown an inch. They're standing eye to eye with you. You didn't see it happen but you noticed their sleeves shortening. Growth happened and you only saw the result. That's how I see faith. It's not a mountain climb where you're either going upward or falling down. It's more like riding a wave. The wave starts small, builds, crashes and levels out; then it starts again. Faith is in the entire cycle not just the crest. Faith is present in the doubts, the questioning, the hope and despair. It's all of it combined into this thing that keeps pushing forward. I don't think God is afraid of our questions. We're so afraid of admitting we have them. We pretend they don't exist and sometimes even convince ourselves they aren't there. But they sit in the crevice of our soul, popping up in moments where life spins out of our control. They flash before our eyes and we choose to engage those questions or deny them. Denying sends us down a road of falsehood. It keeps us locked into cages we don't know we're locked into. We assume we can get out anytime but our denial keeps us there. Only when we embrace our struggle and our questions, do we get free. Then we're able to embrace faith for what it is, not what we want it to be. Liquid faith terrifies me. I'm more comfortable with boxes. Boxes will always be the same, they are dependable and safe. But they also keep you locked away from beauty. Liquid, however, is unpredictable. It moves. It's dangerous and fierce, or calm and soothing. There's no controlling the sea. It does whatever it pleases. Sometimes it takes you where you don't want to go; sometimes it lands you in paradise. 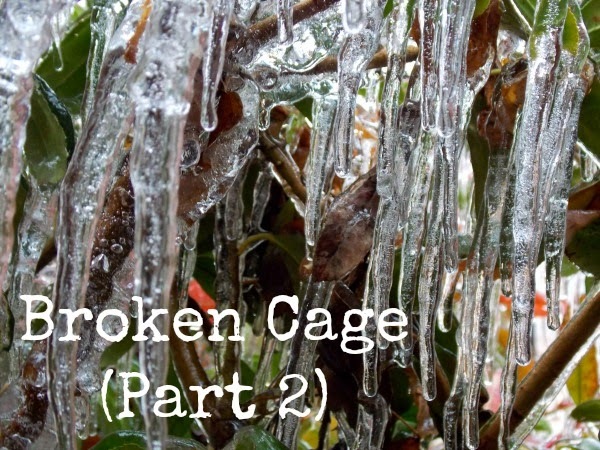 When I realized there was a crack in the foundation of my cage, everything began breaking apart. I tried repairing it with band-aids but they couldn't hold the bars together. All the questions I asked as a kid, all the struggles through grief, all the moments of awe-struck wonder ~ they came rushing in, breaking apart my preconceived notions and adding themselves to my faith. I stood outside the cage basking in new-found freedom and shivering with fear of the unknown. Personally, the entire turn of my faith began with one question, "Why not women?" It may sound trite, but in my tiny existence, this one question opened up a world of questions and I began to view things quite differently. My husband said to me once that when one core belief changes, it alters all of your beliefs. I think that's exactly what happened to me. Once I allowed myself to question one thing, others bubbled up and I grew more bold in asking them. I became comfortable not accepting standard answers, but pushing against them to discover truth. I wrestle with sharing examples from my own faith here because I fear being misunderstood. If I seem vague about the details it's because I am. I worry it'll set my beliefs in stone in the minds of others, when in truth, my faith is still moving. I long to be open about my journey because I know others struggle too and I want them to know they're not alone. I want to be willing to stand honestly and vulnerably in my liquid faith. But I'm scared. I'm not yet strong enough to share it all. I want to be. I hope eventually I will. But these are baby steps and I'm just learning how to not get seasick with this moving faith.